At this week’s ACE meeting the latest figures on Reading schools standards will be discussed. There is a mixed picture for Reading schools but a clear path of how we will improve. Reading has a very mixed school economy, with selective schools, Academies, Free schools, Council maintained, and technical colleges. As well as this, the small geographical nature of our Borough means nearly 10% of our primary age students are educated under other authorities, and nearly 30% of our Secondary age students. This is similar of students coming into the Borough. At Key stage one for those having just started schooling, phonics is improving, Reading is secure, writing is lower than expected and Maths is at the national average. Our new education strategy will have a focus on writing for primary schools and facilitating peer working between schools to raise these outcomes. 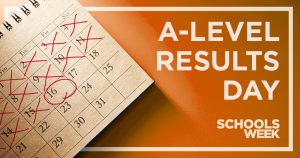 At Key stage 2 student results are increasing but not quite keeping pace with the increase in national results. 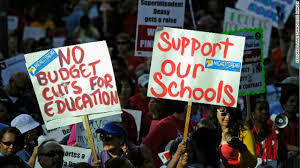 This picture is still mixed as our schools do well with students exceeding expectations and our Council maintained schools do better than our Academies. Our strategy sets out closer working with the regional schools commissioner to help with this. At Key stage 4 and 5, our schools progress scores are good and above national averages. With A levels in particular the towns outcomes are outstanding. But the picture here is also still mixed. Our disadvantaged students achievements are too low (another focus of our new strategy) and our selective schools schools are attended by just 24% of Reading pupils, but both Kendrick and Reading boys are making positive moves to increase these numbers. The mixed nature of who runs our schools is getting more complicated every year. This is making monitoring our schools more difficult every year. But our new education strategy will take steps to prioritise and inform our education provision to help all Reading students achieve the best they can with the one chance at education they get. This entry was posted in Education on December 4, 2018 by Ashley Pearce. Councillor’s advice surgery: Church Ward Councillors will be available to discuss any issues with residents on Saturday 1st December at 10.30am-12pm at The Whitley Café. Calendar delivery: Copies of the latest edition of our popular South Reading calendar, with events from January to June will be delivered to households across the Ward by our Councillors & volunteers at the end of the month. This can be viewed under the News section of this site. ACE committee meeting: Ashley and Ruth will be in attendance at the Adult, Children services and education committee meeting on Tuesday 12th December at 6.30pm at the Civic centre. Education standards will be discussed by Ashley as lead member for education. Church Ward Labour party meeting: members of the local party will be meeting to discuss issues & campaigning on Monday 3rd December at 7pm at 103 Northcourt Avenue. Carols by candlelight: Ashley will be attending local homeless charity Launchpads Carol service at Minster church on Thursday 6th December at 7pm. St.Barbarus Christmas Service: The annual Christmas Service at St.Barnabus will be attended by Ashley on Sunday December 9th at 6pm at the Church on Elm Road. Labour All Members Meeting: Ashley will be giving a short presentation and answering any questions regarding education issues at Labour’s AMM meeting at the Civic service on Thursday December 13th at the Civic Centre. Head teachers meeting: Ashley will be meeting with head teachers from across the town on Thursday December 6th at 9.30am at John Madejski Acadmey to discuss education provision in Reading. This entry was posted in Events on November 25, 2018 by Ashley Pearce. 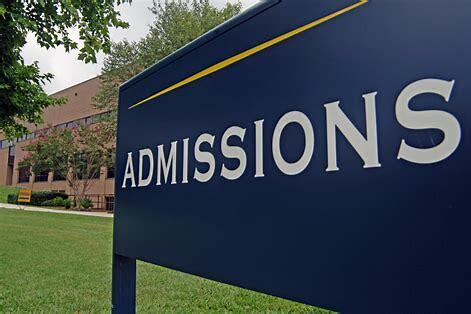 The School Admissions Code requires all relevant authorities to consult on their admission arrangements at least every seven years and Reading is now due to undertake this process. The Council has taken the opportunity to review some areas and is now keen to receive feedback. Some of the changes are concerned with validating applications, late applications, disputes between parents and sibling protection. Respondents are invited to answer the survey questions on one, two or all three revised documents. The School Admission Co-ordinated Scheme & Policy 2020/2021 Consultation can be found at www.reading.gov.uk/schooladmissions2020and the deadline for responses is 9th December 2018. This entry was posted in Education on October 18, 2018 by Ashley Pearce. This entry was posted in Education on September 25, 2018 by Ashley Pearce. This entry was posted in Ward News on September 25, 2018 by Ashley Pearce. The 2014 Childrens and Families Act made it law that special educational needs provision must be constantly under review. This means that we are always looking at ways to improve the education provision for our youngsters with additional needs all the time. Here in Reading around 15% of our school students have some form of special educational need with around 3% having an EHCP (Educational health and care plan), that identify and tailor support to students with additional funding. Improve early identification of need within our youngsters. In 2017/18 the Council turned 401 statements into EHCPs which was a vast improvement on the 463 in the previous 3 years and was praised by Ofsted. It is vital we work with schools, nurseries, GPs and pre schools to identify as early as possible the needs of our students. Extending The Base for students with autism at Blessed Hugh Farringdon. This will involve a new building being built that will increase capacity from 15 to 30 students. This will mean more students being able to stay in mainstream provision within the Borough. At Primary level we are looking at replicating the Ark centre for primary students with autism in two other schools across town. The Ark caters for 21 students at Christ the King in South Reading, and we will be looking to replicate this in a school in the north and the west of the town. 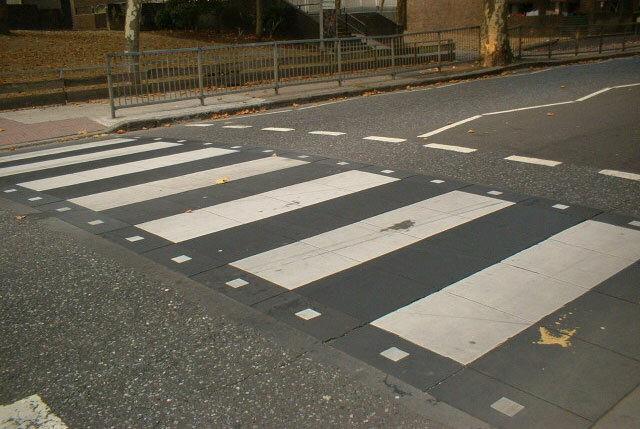 This will increase capacity and cut down on these students having to travel across town. These schools will then be able to provide expert outreach to other schools to help improve provision. The Avenue school is in the process of applying to extend an area of the school to provide additional spaces for 25 students with differing needs. Phoenix College which provides education for students with SEMH (Social, Emotional, and Mental Health) needs is currently based at an outdated building on Christchurch Road. 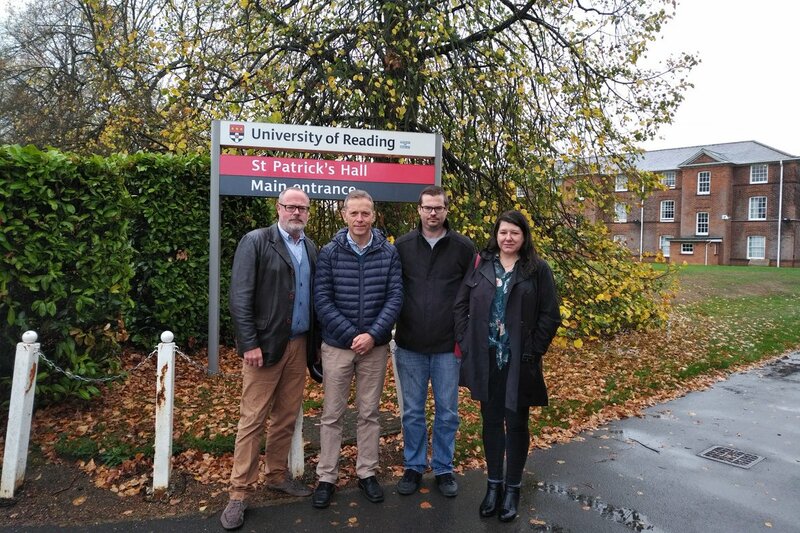 We are actively looking at sites for a new modern facility at a different site in Reading. This will provide a better learning environment for students in the future. 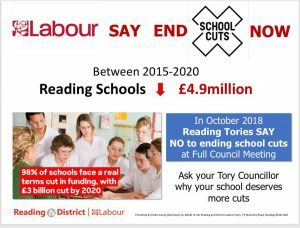 These improvements are against the back drop of Government cutting funding per pupils by 8% and our SEN youngsters often suffer worse than this. 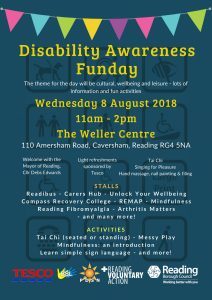 This week there is a Disability Awareness Fun day at The Weller Centre in Caversham. 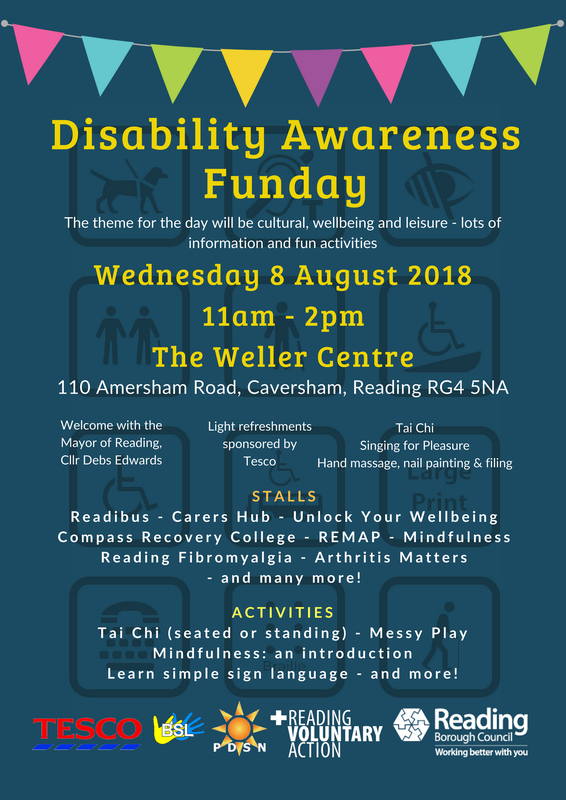 The day runs from 11a.m.-2pm and is a great way to learn more. This entry was posted in Education on August 6, 2018 by Ashley Pearce. Every time the Council agrees for a large building project to go ahead, the developer has to pay the Council what is called Community Infrastructure Levy or CIL which is used to help the town prepare facilities Unocal areas. Some of this money is kept back for the specific area involved, the Council wants to hear your view on how this should be spent. The above link will enable you to fill out your details and say how you would like the money to be spent in your area. All of the projects we hope would benefit the local area but pleases let us know your thoughts. This entry was posted in Ward News on August 3, 2018 by Ashley Pearce. The Local Authority recognises from Kendrick School ‎a genuine desire to increase their admissions to the school for both Reading students and those eligible for Pupil Premium. The changing of their admissions criteria to encourage those eligible for Pupil Premium as well as those from specific postcodes is to be welcomed, as is their detailed plan for outreach work after negotiation with the authority that will open up opportunities for able girls from within Reading’s most disadvantaged areas. However we are unable to offer our full backing to this proposed expansion. 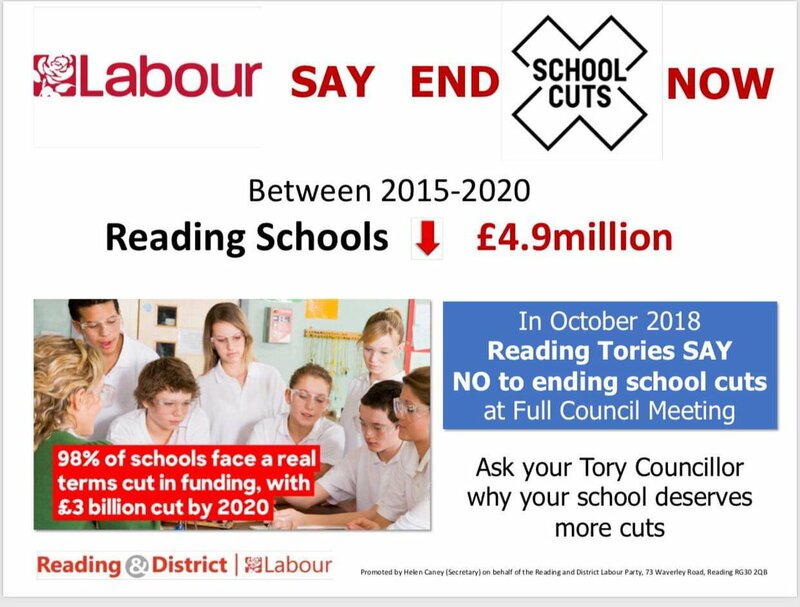 At a time when other schools are facing a per pupil funding cut of 8%, we believe that this additional funding should be helping all schools and all pupils. ‎We would welcome a commitment from the school to fill all of the additional places available with Reading students eligible for Pupil Premium. The school has demonstrated it’s willingness to co-operate and adapt to help meet the Council’s educational aims and we hope that this can continue. This entry was posted in Education on August 1, 2018 by Ashley Pearce.